Summer 2018. 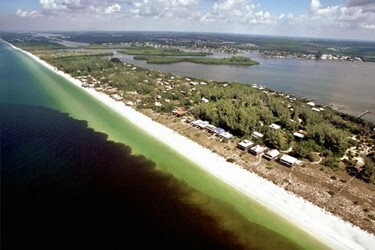 The west coast of Florida. A red tide spreading along this Gulf of Mexico shoreline has killed millions of fish, threatened the health of human residents and affected tourism in the region. Nationwide, such harmful algae blooms cost an estimated $50M each year. To study the effects of harmful algae blooms and other ocean and Great Lakes pathogens, the National Science Foundation (NSF) and the National Institute of Environmental Health Sciences (NIEHS), one of the National Institutes of Health, have awarded new grants totaling $30M. The grants fund research on ecosystems in the oceans and in the Great Lakes Basin. "These grants will allow us to better understand the public health risks associated with environmental exposures in marine coastal regions and the Great Lakes Basin," said Fred Tyson, a program director in NIEHS' Division of Extramural Research and Training, Cellular, Organ and Systems Pathobiology Branch.